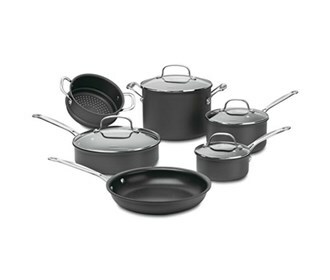 The Cuisinart 66-10 chef's classic 10 Pc. set have included everything you need to perfectly perform all the basic cooking tasks, large or small. The hard anodized cookware features durable hard anodized construction for fast and even heating eliminating Eliminates hot spots. The 66-10 features Quantanium & nonstick cooking surface which is reinforced with titanium for lasting food release, healthy cooking and easy cleanup. Break-resistant glass covers allow you to monitor food while it is cooking without losing heat or food flavors. Tightfitting covers seal in moisture and nutrients for healthier, flavorful results. The Cuisinart Chefs Classic 10-Pc Anodized Cook Set has many exciting features for users of all types. You can extend the lifetime of your Cuisinart Chefs Classic 10-Pc Anodized Cook Set with the purchase of a FactoryOutletStore Factory Protection Plan. 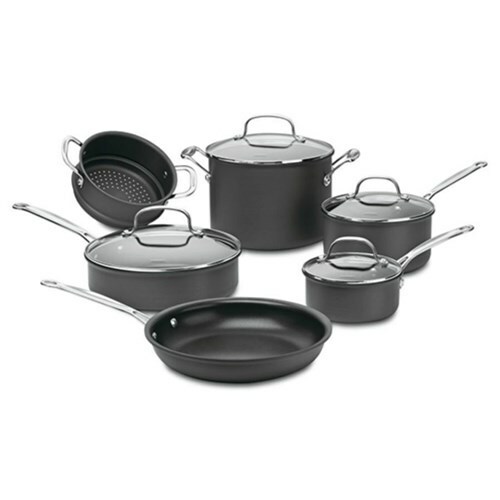 See the Cuisinart Chefs Classic 10-Pc Anodized Cook Set gallery images above for more product views. The Cuisinart Chefs Classic 10-Pc Anodized Cook Set is sold as a Brand New Unopened Item.